Western facade of the Parthenon. In the foreground, a well-preserved segment of the Mycenaean period fortification wall of the Acropolis. The distinctive masonry style of the wall consists of largely unworked boulders. Later Greeks viewed walls like these at Mycenae and Tiryns and were so impressed by the massive size of the boulders that they told stories about the legendary one-eyed giants (the Cyclopes) who built these walls for heroes such as Perseus. As a result, this type of construction is known even today as "Cyclopean" masonry. This Mycenaean fortification wall (probably built after c. 1250 BC) functioned as main defensive wall of the Acropolis until the Persian attack in 480 BC. Even later, segments of the wall were still visible on the Acropolis and probably had great symbolic value because of their antiquity and connection with the "age of heroes". The segment visible in this photo is located immediately south of the Propylaia and west of the sanctuary of Athena Nike. 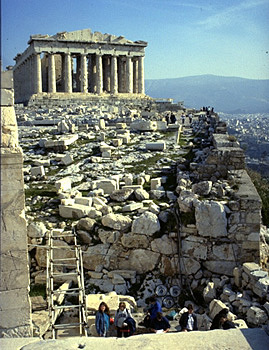 Photo taken in 1989, from the west (from the modern roof of the temple of Athena Nike).